Same. I have done AG1's, Deity Knuckledusters, and even the Specialized SIP lockons. Nothing come close to the ODI Elite Pros: that little bump on the top makes all the difference in the world. That made that segment even better. I think my favorite part of the bike is the O-ring knocked off the shock. I own a Patrol and I know how hard it is to do that, lol. Very info-filled bike check...curious if the mastic tape on the chainstays helps with the noise. Been tempted to try that myself. Maybe I'll give it a go tonight. This is one of the best looking bikes, evar. I want to hear how those bars ride as well! Highly highly highly recommend this program for anyone wanting to improve their skills, or move into coaching. 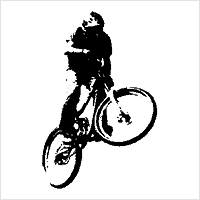 I am lucky enough to be a coach for Evergreen Mountain Bike Alliance, and they use this program to make mountain biking accessible to everyone. This press release has 1 comment. Level playing field. I like it. Both Martin and Cecile said they "lost" fitness by doing DH races and it hurt them going back into the EWS. I say let Sam be Sam... he could run tricycles and I would root for him. This feature has 51 comments. Ratty "helping develop the YouTh!" seems like a pretty big hint... especially since they got Rob and Tippy over there. It would be sick if Transition picked him up though. Great podcast from a great bike company. As a Deity fanboy, I was pleasantly surprised by the ANVL stuff that came stock on my new Patrol: first bike I have ever owned that I didn't need to switch the bars/stem out. Radical bikes from a rad group of people. I saw the tires and was like "That's gotta be Skye's bike..." Sick bike man, we need more vids of you riding.